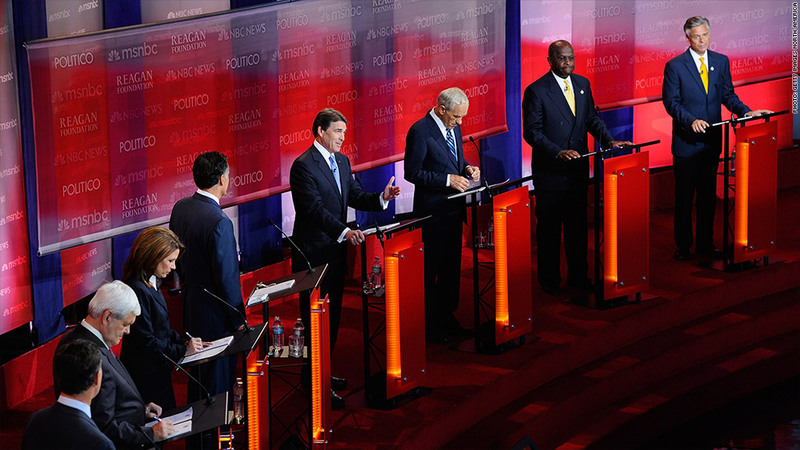 NBC hosted a Republican debate in September 2011 that aired on MSNBC. There were bound to be some snubs when the Republican National Committee unveiled a slimmed-down 2016 primary debate schedule. But a few of the exclusions really stood out. The schedule was released on Friday, but media tongues are still wagging about liberal MSNBC not being in the mix for a conservative debate. Also, representatives of Univision are making no secret of their disappointment in not being picked. Talks are still underway for a "conservative media debate." Outlets like Newsmax, Glenn Beck's The Blaze, the Daily Caller and the Washington Times might be involved with that one. The RNC declined to comment on the behind-the-scenes maneuverings that produced the debate calendar, which starts with an August debate airing on Fox News and a September debate airing on CNN. But a senior GOP source said Fox, CNN and other news outlets essentially submitted "bids" and haggled over details like locations. The RNC's work on the debates schedule is new. In 2012, the RNC was not involved in the 20-plus debates that overwhelmed the primary process, so the committee is trying to restore some order this election cycle. The party will only sanction nine debates, although it could add three more to the schedule later. That may be one reason why NBC was awarded fewer debates this time around. Still, the snubbing of NBC's cable news channel MSNBC is getting a lot of attention. NBCUniversal hosted a total of four debates during the 2012 cycle. Two aired on MSNBC, although they weren't moderated by MSNBC personalities. This cycle, NBC has two -- one to be hosted in October 2015 by CNBC and one co-hosted by NBC and its Spanish-language network Telemundo in February 2016. The GOP source said a debate moderated by MSNBC personalities would have been a non-starter, and both sides knew it. Recent history between the two sides has been fraught: The RNC warned NBC (and CNN) in 2013 that the outlets would be left out of the party's 2016 debate plan if they went through with planned productions about Hillary Clinton. Both networks ended up nixing the Clinton projects. 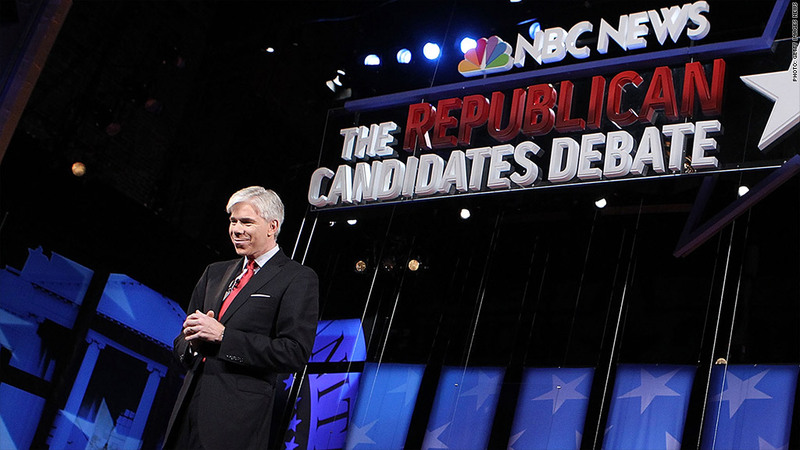 Former NBC host David Gregory moderated a Republican debate in January 2012. RNC chair Reince Priebus also threatened a boycott of MSNBC last year after the network suggested in a tweet that the "right wing" would hate a Cheerios Super Bowl ad featuring a biracial family. MSNBC apologized and deleted the tweet. The person responsible for it was reportedly fired. Afterward, Priebus made it clear that he was still wary of the channel -- he said MSNBC was on "probation." In some ways, Univision's absence is more surprising than MSNBC's, as it is the most-watched Spanish-language network. Telemundo is a distant second. Jorge Ramos, a popular anchor for Univision, said over the weekend that politicians who ignore Latino voters do so at their peril -- an apparent response to the debates calendar. "I believe that Latinos and millennials will decide the 2016 presidential election," Ramos said. "The sooner Republicans and Democrats realize this, the better their chances to win the White House. It's always a strategic mistake not to include in your plans the fastest growing segments of the electorate." Bloomberg, which sponsored a Republican debate in the 2012 cycle, was also shut out by the RNC this time around, despite the channel's recent addition of a high-profile TV show hosted by Mark Halperin and John Heilemann, the authors of "Game Change." A spokesman for Bloomberg declined to comment. CNN (the owner of this web site) and Fox News have each been given at least two debates for the 2016 cycle. Each channel could also land a third. Fox Business Network will also host a debate. Along with NBC, the other two major broadcasters, ABC and CBS, were dealt one debate each. The RNC has made it a priority to include what it calls "conservative media partners and panelists" in the debates. It will announce some of those panelists in the weeks to come.